Attention to detail—this is the characteristic that makes a good wedding planner and, subsequently, also a memorable wedding event. In order to achieve this, one of the things that a wedding planner must focus on is the practical and creative use of different wedding-related items. In this article, we focus on the smallest and often overlooked among them which is the wedding address label. The Calligraphy Wedding Address Label template follows a very minimalist design. This address label works well for those who are planning to have elaborate decorations on other aspects of their wedding but do not want to overdo it. So they can employ a minimalist design on minor wedding stationery components like their wedding address label. 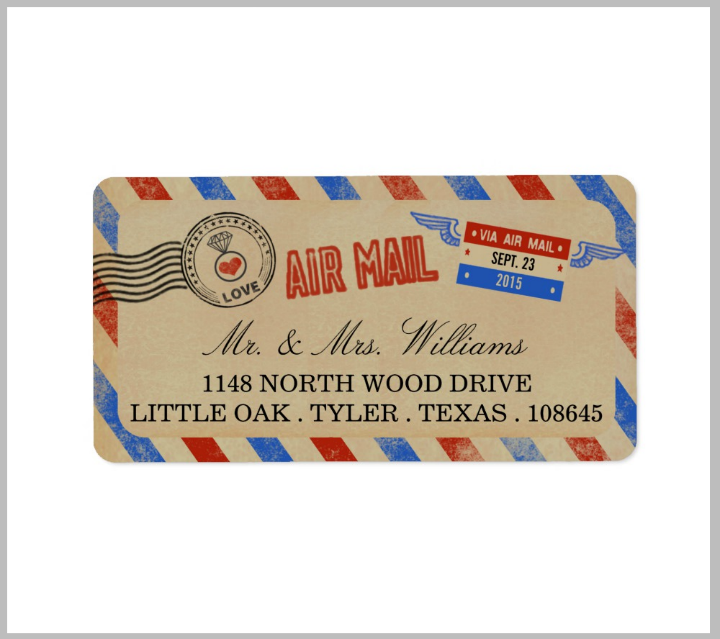 The Airmail Wedding Address Label template pictured above will suit those who wish to have a travel-themed wedding theme. This wedding address theme will also work well with the Airmail Wedding Invitation Template found in this list of wedding invitation templates. This cute address label design template is best printed out on thick Kraft paper or on coffee-colored card stock. To make the label template truly your own, it is best to add travel icons that will specifically relate to your own personalities as a couple. The ampersand symbol is a recurring design theme used in different mediums like paintings, digital art, and interior design. For couples who appreciate good design aesthetics, you may find the Ampersand Wedding Address Label template useful. Use this label template if you want a simple wedding address label whose design is punctuated by an elegant ampersand symbol. As shown in the template mockup above, this template may be printed out on rustic Kraft paper, on plain white cardstock, or on a clear plastic sheet. Whatever printed media you choose, it is clear that this label template is a versatile one. Another wedding address label template following an uncluttered design is the Custom Wedding Address Label whose mock-up example is featured above. This label template highlights the name of the couple written in elegant calligraphy font style. You may have this address label template printed out on pieces of paper or on the envelopes that you will send out to your wedding guests. An alternative will be to have a custom rubber stamp created showing this address label. This way, you will just have to stamp the label template onto any flat surface you wish to include as part of your wedding stationery set. Use the Elegant Sticker Wedding Address Label template pictured above if you intend to use wedding address label stickers instead of the more common printed business card types. By using a sticker address label, it will be easier to dispatch wedding address labels on the wedding stationery sets sent to guests before a wedding. This label template is fully editable and you may incorporate additional design elements that will help distinguish your wedding papers from others. 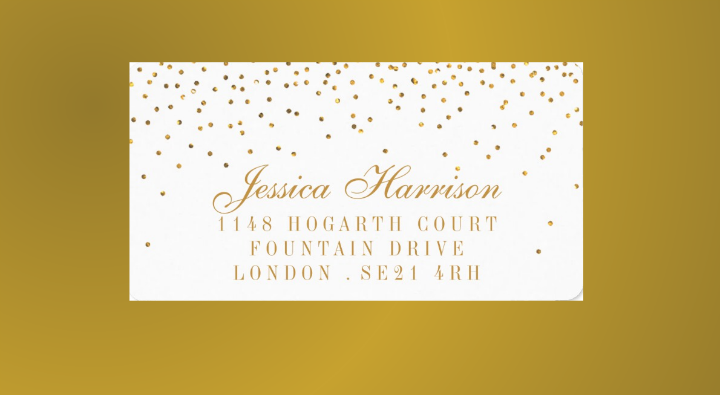 Choose the Gold Confetti Wedding Address Label if you want the luxurious effects of using gold design elements. 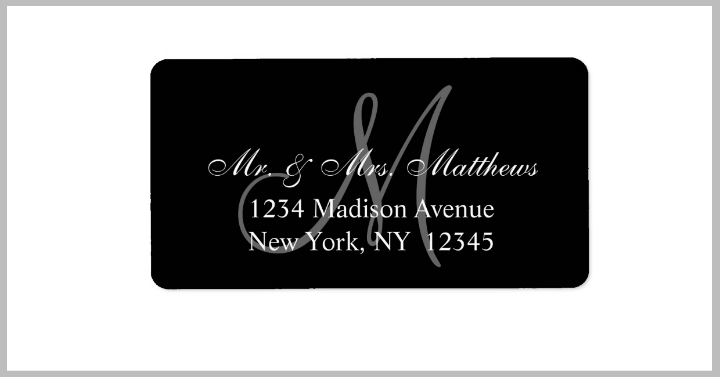 This wedding address label template may also be used as a personal address label if you prefer. For couples who are following a golden wedding motif, this type of wedding address label will be a good addition to it. As mentioned earlier, wedding address labels are typically used for formal wedding celebrations. 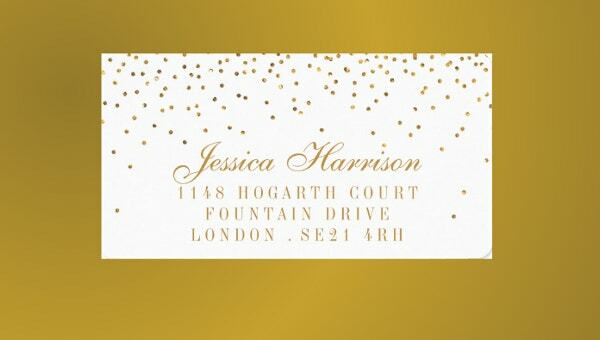 Slight variations may be made on the address label design if you want to use them despite not having a formal wedding. Listed below are a few reasons why you should use wedding address label templates. Wow your wedding guests. If you want your wedding to make a lasting impression on your guests and on your own memories, you should take special care in attending to its details. These days, having an elegant and creatively designed wedding invitation card is not enough. You need to also harness your creativity and apply this toward other design elements that will be used for your wedding. A wedding address label, for instance, is not even included in most wedding invitation packages. So if you add a creative address label to your invitation set, this will pique the guests’ interest and all the more they will be intrigued if you create a unique wedding address label. Express yourself through your wedding stationery. Wedding address labels are part of the wedding papers that need to be created before a wedding. And just like any creative endeavor, you are free to use any design creation for your stationery templates. Artistic couples may enjoy this aspect of the wedding planning since they are able to express another side of their personalities. This is also an opportunity for your wedding guests to know about a couple’s other artistic skills just by looking at their wedding address label design. Organize the wedding gift-giving process. Wedding guests are traditionally required to get a new couple a present. Even in modern times, this tradition has carried on. New couples should prepare themselves for this aspect of having a wedding since this can easily get out of hand especially if you are inviting a lot of people to your wedding. By including wedding address labels in your wedding invitation kits, your guests will be inclined to send their gifts to the physical address instead of bringing them along to the wedding reception venue. Inform others of your new address. Perhaps the most obvious reason for using wedding address label templates is to inform your guests of your new address. Weddings, after all, signal the start of your new life as a married couple so you should let people know of this new setup. If the couple did not live together before their wedding, using wedding address labels will be especially helpful for friends and relatives. Browse through the different wedding address labels embedded below. 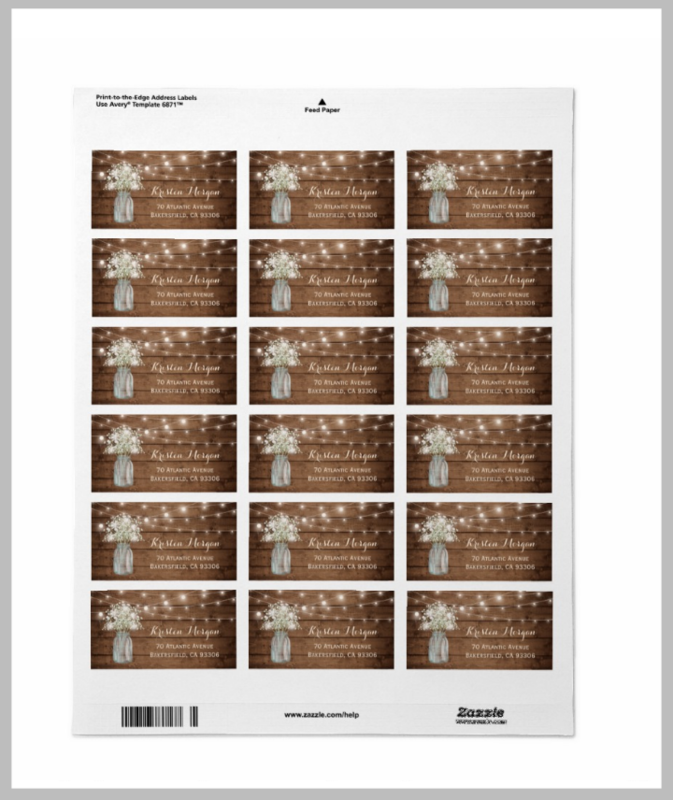 You may choose any address label template that you like and customize them to match your own wedding motif. Couples who want their wedding address labels to exude a sense of professionalism should try out the Monogram Wedding Address Label embedded above. In this label template, couples can customize the template’s background and font colors and also change up the typeface used. This way, they will be able to choose a label template that will best match their personalities. This kind of label template may suit those couples who are working in a professional field. This wedding address label lets them show their serious and formal sides. The Personalized Wedding Address Label template set pictured above is similar to the ampersand wedding address label mentioned earlier. The defining characteristic of this address label is its ring design and the script fonts used to write the couple’s name and new address. 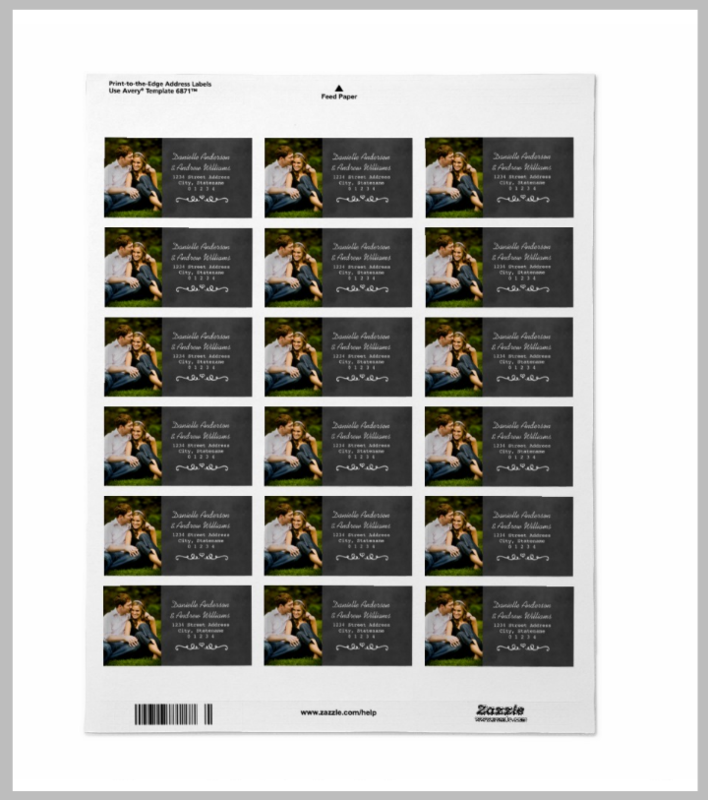 Just like the previous label template, this can also be printed on clear plastic, Kraft paper, and white cardstock. 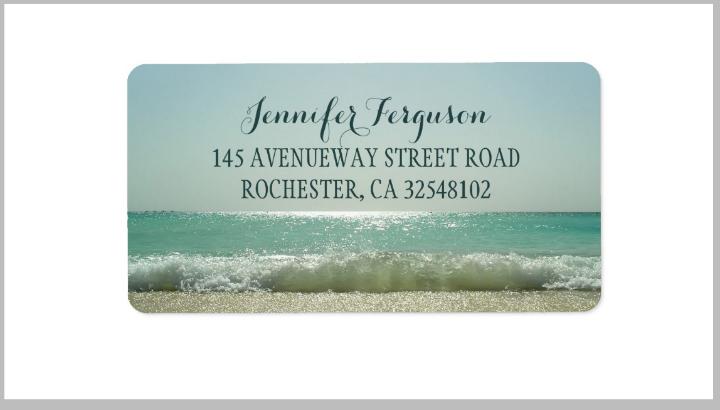 If you want to showcase a couple photo on your wedding address label, the Portrait Wedding Address Label template shown above may be a good fit for you. This printable label template also follows a chalkboard design so it may be used for weddings that follow a chalkboard motif. This template is available for a minimum purchase of 5 sheets. Each sheet will give you 18 individual wedding address labels. End-users may also fully customize the text and image on the address label. This Rustic Floral Wedding Address Label template may best suit those who are planning a summer or spring wedding. The decorative flowers on the label help lend a cheerful feeling to the whole wedding event. 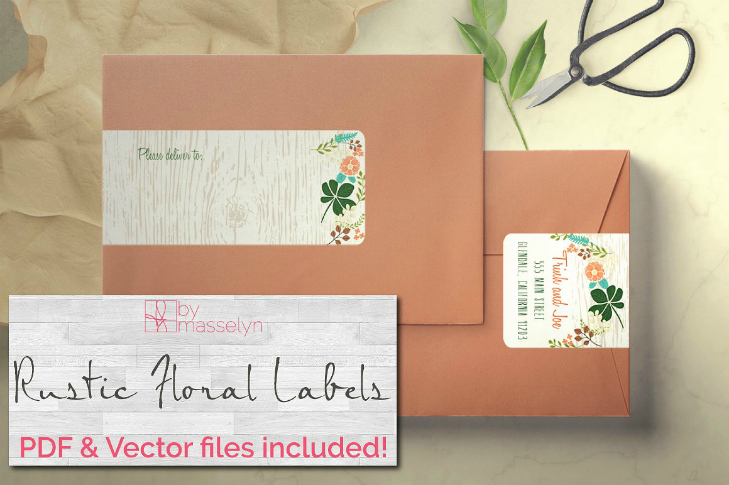 If you are using this label design template, make sure to also use wedding envelope designs that feature flowers or those that have a lively color. 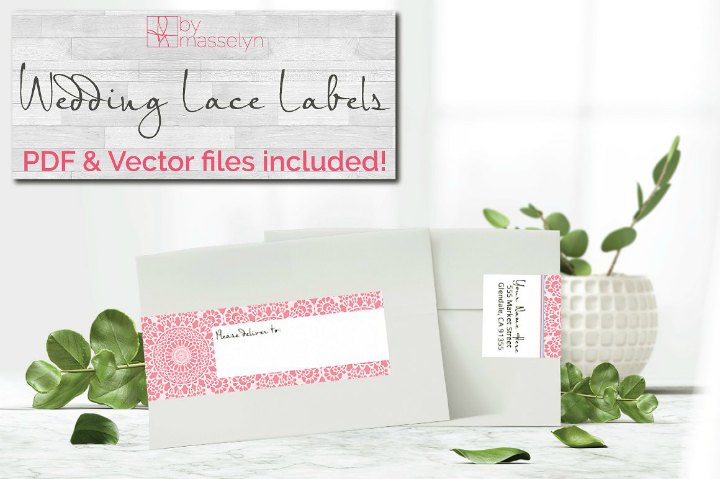 To save time, you may print out blank label templates and only fill them out once you have stuck the wedding address labels to their corresponding envelopes. Traditional address labels are printed documents used in business to specify a person or entity’s shipping and/or delivery information while wedding address labels are small printed documents indicating a couple’s new address. 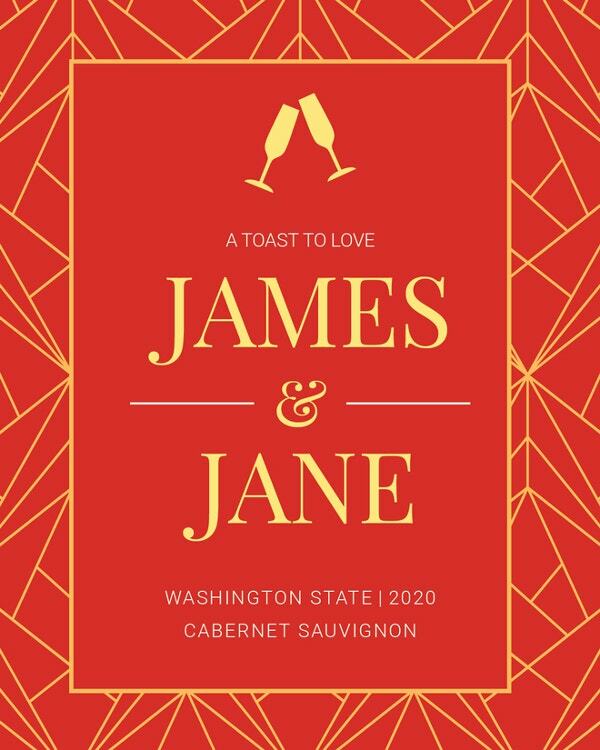 These address labels are sent to the wedding guests as a way to let them know where to send gifts and/or to inform the guests of the couple’s new address. The address labels themselves are printed on a small piece of adhesive paper. This allows the labels to be easily stuck to envelopes and parcels. Wedding address labels, on the other hand, may not include an adhesive backing since these address labels are just printed like a regular printable business card. Most modern wedding address labels will follow the design theme or motif of a wedding. This way, the address will not look out of place as part of the wedding stationery set sent out to all wedding guests. The Wooden Wedding Address Label is another address label set that is available with a minimum order of five sheets. This label template has a rustic feel due to the wooden background and the string of decorative lights. This type of label template will also work well with other rustic wedding invitation templates. It is best to print out this address label design on plain cardstock or premium paper. This way, the brown wood and white mason jar elements will stand out more.